Hello Sailor by Lipstick Queen might appear to be the most intimidating lipstick on the market. It. Is. Blue. As in, blue blue (think smurfs, blueberries, bluejays...you get the idea). 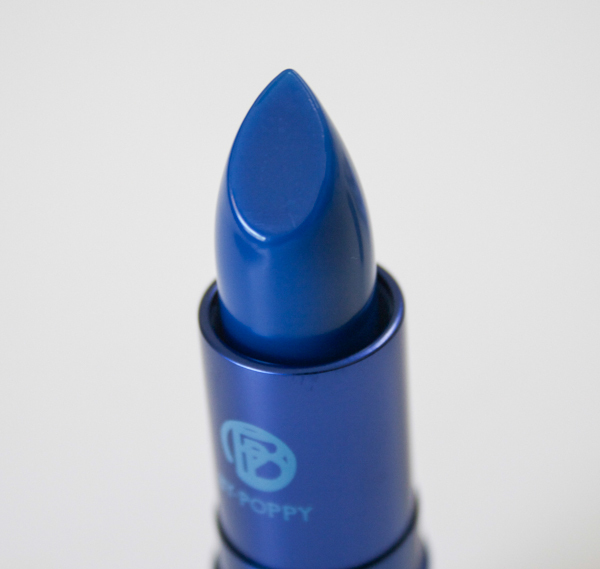 While blue is a pretty color (my personal favorite), most of us aren't eager to slap on a blue lipstick. But that's where Hello Sailor is misleading. Rather than apply as a rich navy blue color (as the bullet above would suggest), Hello Sailor is delightfully sheer when applied. 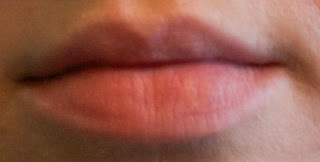 It gives off barely any color at all, but does add a healthy looking sheen to the lips. After sitting on the lips for a few minutes, Hello Sailor makes it appear as if I ate a bowl of blueberries hours ago. It gives a subtle blueish purple cast to my lips. Poppy King, the creator of Lipstick Queen, describes Hello Sailer as a whole new take on the blackberry lips trend--sheer and modern, instead of dark and vampy. 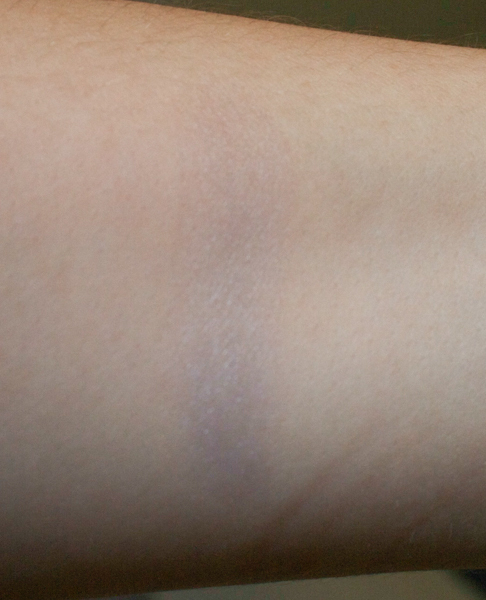 Arm swatch in natural light -- Hello Sailor is barely visable. Because of its sheer nature, Hello Sailor does not last long on me (it's worth noting that I am probably worse than most when it comes to getting lip products to last, as I--apparently--have a habit of pressing my lips together when I am concentrating). I have to reapply at least every hour if I want anything to show up on my lips at all. My lips with Hello Sailor. Some have described Hello Sailor as a 'mood' lipstick, but I have to disagree. But it probably does look different on just about everyone because it is so sheer, meaning your natural lip color will combine with Hello Sailor and that will be what appears on your lips. Hello Sailor is pretty and subtle, and is somewhat slightly different from other products on the market. But I don't think it is absolutely necessary to any collection. In the meantime, however, I will enjoy shocking people when I pull out my blue lipstick (I suspect that the shock factor is the main point of this product). If you want to pick up Hello Sailor, Lipstick Queen has recently been introduced into Ulta. I was surprised to find that my local store had a full display of Lipstick Queen when I popped in last week. 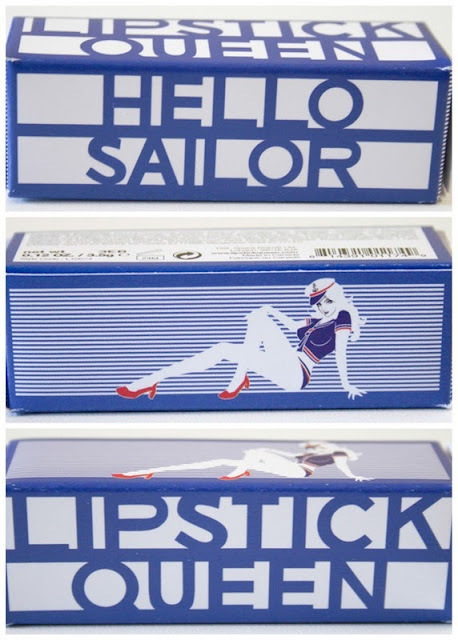 Hello Sailor retails for $25 and, in addition to Ulta, is available from LipstickQueen.com.